Join NESEA for the first BuildingEnergy Pro Tour of 2019, featuring an environmental learning center built for LEED Platinum certification. This tour, hosted by A.W. Hastings, will highlight the sustainable features of an environmental education center that acts as the gateway to a 450-acre site owned and operated by New York State Department of Environmental Conservation. The tour will begin with an off-site opening presentation, where the hosts will give an overview of the project. 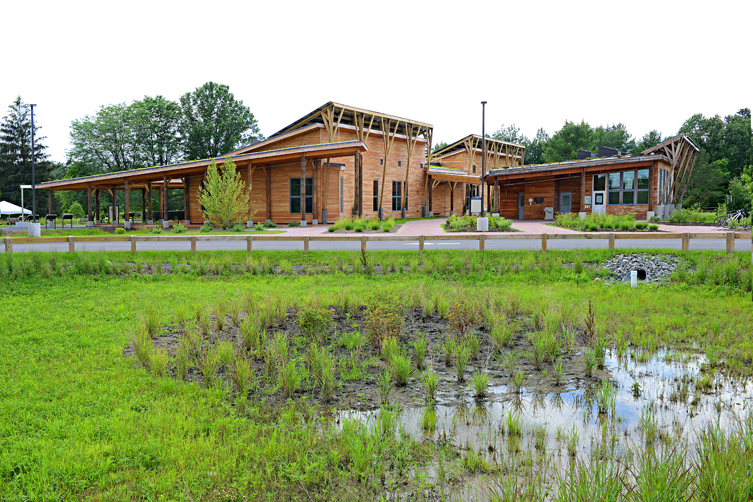 Attendees will learn how design decisions were driven by the conservation goals of the environmental center and the non-profit conservation group that operates onsite. Attendees will then travel by bus to the site to see the project, and hear from additional members of the project team about specific aspects of their work on the building. The tour will cover interior and exterior aspects of the building, as well as the sustainable landscaping strategies that were employed for site design. Topics that will be discussed include strategies for site placement that best optimize daylighting, views, and solar potential; materials selection; rainwater harvest system; energy systems; and bird friendly design strategies. The event will conclude with a reception and a Q&A with the project team.